A recent study by the University of South Australia concluded that our children are less fit than we were at the same age, has our fast food mentality and more sedentary lifestyle contributed to our children's decline in health? Australia's advertising watchdog has upheld a complaint against fast food giant McDonald's after vouchers for free fries were handed out to children at a playground. 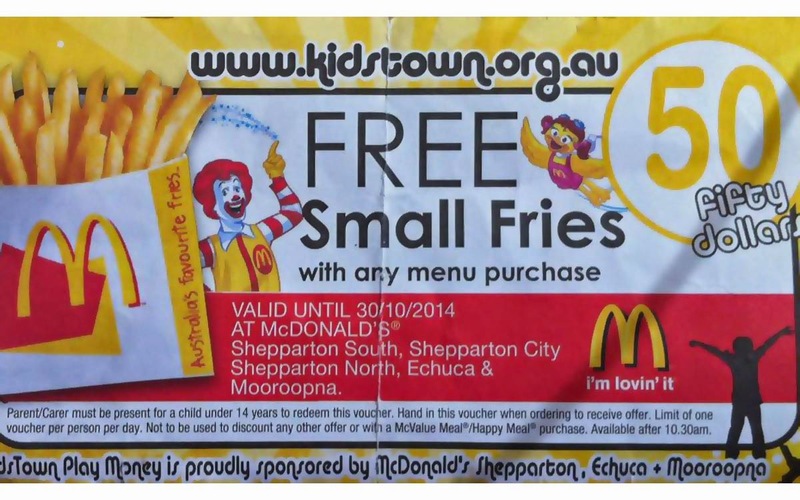 The vouchers for a free small fries were being handed as children entered Kids Town Adventure playground near Shepparton in Victoria's north. The Obesity Policy Coalition launched a complaint with the Advertising Standards Bureau - ASB - arguing the fast-food chain was not promoting healthy eating choices for children. The ASB upheld the complaint ruling McDonald's breached a section of the Quick Service Restaurant Initiative - QSRI - for responsible advertising to children. McDonald's has also come copped recent criticism for trialing a home delivery service in an area already battling with weight issues. The Australian Medical Association - AMA - Queensland has questioned McDonald's decision to trial a seven days a week home delivery service in Hervey Bay, in the state's south-east. McDonald's said population growth in the region was a key reason for its selection, but AMA Queensland president Dr Shaun Rudd said it was the population's growth on the scales that had them most concerned.